Thorough. Accurate. Reliable. Engaging. 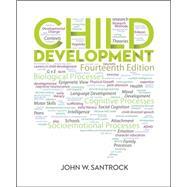 These are just a few of the words used by adopters and reviewers of John Santrock's Child Development. The new topically-organised fourteenth edition continues with Santrock's highly contemporary tone and focus, featuring over 1,000 new citations. The popular Connections theme shows students the different aspects of children's development to help them better understand the concepts. Used by hundreds of thousands of students over thirteen editions, Santrock's proven learning goals system provides a clear roadmap to course mastery.